A report by the German Environment Agency of 4 November 2016 states that particulate matter pollution does indeed impair people's health. In the years from 2007 to 2014, an average of 45,300 premature deaths are attributed to the fine dust concentration in the outdoor air in Germany each year. Therefore, effective filter systems in room air conditioning systems that separate the fine dust from the outdoor air are an important contribution for maintaining good health. In humans, fine dust with a particle size of PM10 can enter deeper areas of the bronchial tubes through the nasal cavity. 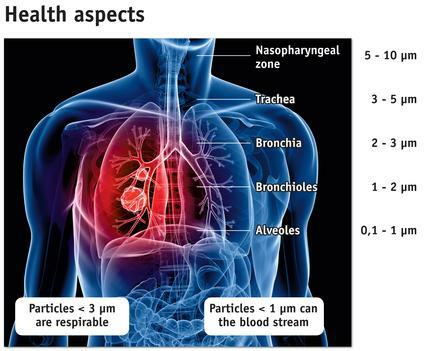 The even smaller PM 2.5 particles can reach the bronchioles and alveoli. The ultrafine particles with a diameter of less than 0.1 µm can even enter the lung tissue and blood stream. The effects on health and well-being of fine dust vary depending on the size and penetration depth of the particles. These effects range from harmless illnesses, such as irritation and inflammation of the mucous membranes and localised inflammation of the throat to increased plaque build-up in the arteries, thrombophilia or changes of the regulating function of the nervous system. In view of the increasing particulate matter pollution, the standardisation committees have also taken this aspect into account. EN ISO 16890 "Air filters for general room air conditioning systems" has created a standard that is focused on the subject of fine dust. It contains comprehensive and very detailed test procedures to determine the most important threshold values for air filters. What are the differences between the old and new test standards? With the goal to improve the ability to comply with the air quality standards, the ISO 16890 test and classification procedure is aligned with the specifications of the World Health Organisation WHO and the environmental agencies. There are three fine dust fractions PM 10, PM2.5 und PM1. While the filter classification to DIN EN 779 was solely based on a particle size of 0.4 µm in the past, the filter efficiency is now measured with three different particle fractions of PM10 – all particles up to 10 µm, PM2.5 – all particles up to 2.5 µm, PM1 – all particles up to 1 µm. The fundamentally changed measuring procedure makes it possible to select the best filter for a particular local particulate matter concentration in the atmospheric air. Fine dust is always a complex mixture of solid and liquid particles with a very broad range of different sizes. Additionally, filters are no longer fed with ASHRAE dust to measure efficiency and flow resistance. EN 799 uses ASHRAE dust as test dust. Additionally, particles (0.4 µm) with DEHS are measured. This results in an average efficiency that is used for the classification. 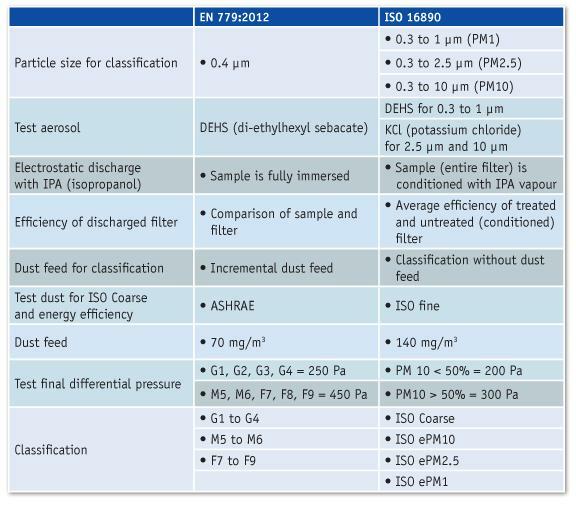 ISO16890 replaces the ASHRAE dust with a new ISO- A2 fine dust. This dust is used to load the sample; however, it has no effect on the PM classification. The PM1, PM2.5 and PM10 values are determined by the DEHS and KCL aerosols. Realistic illustration of the impact on the function of a filter, which is no longer possible with the ASHRAE dust. The ePM specification is a mean value that is derived from the respective test of a treated (conditioned with IPA steam application) and untreated filters to prevent a falsification of the measured results due to static charges. When an arrestance of 57.2% PM10 is measured, the filter belongs to the ISO PM10 fine dust fraction. The value of the arrestance is rounded to 55% and specified with ePM10 (55%). If a filter medium separates 65.2% of particle size PM2.5, it belongs to the ISO PM2.5 fine dust fraction and is specified with ePM2.5 (65%). The new standard draws attention to the adverse health effects of fine dust once again. The realistic test and classification procedures make it possible to select the best filter for a particular local particulate matter concentration based on the desired efficiency for the applicable particle fraction. In conclusion, a health-conscious filter selection provides a significant improvement of indoor air quality. Whether or not a new quality of filtration is achieved for the duration of the entire service life remains to be seen. 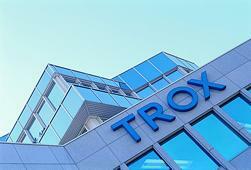 The energy efficiency will be the driving force for this subject matter. In the future, the assessment of the energy efficiency of a filter will not only include the average differential pressure but also the degree of fraction separation. This means that there is a direct correlation between filter efficiency and energy requirement. This will then be of interest for the entire duration of the life cycle. Initially, existing filter media will be used, which are then classified according to PM . The respective application determines the required indoor air quality.